Let's be honest, it can be hard to be taken seriously when all anyone in mainstream American society knows about you is based on a stereotype. The very real result of stereotypes and falsehoods is that the very pressing issues never get addressed or even discussed. Some people have questioned why Native people are fighting to change offensive sports team names/mascots when there are "more serious problems" that need attention. That line of thinking is part of the problem, because the very reason the "more serious problems" exist is the systemic racism which birthed offensive sports team names/mascots in the first place. 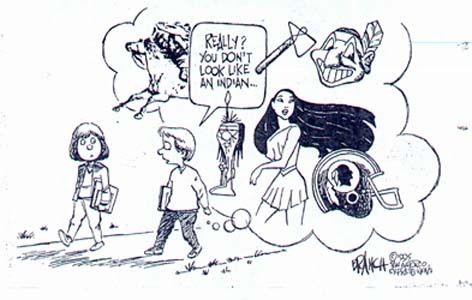 Systemic racism and stereotyping of Native people and cultures is the root of the "more serious" problems, and thus must be addressed first. And by the way, systemic racism is by no means a 'less serious' problem for Native people than any other. So take a look at the material here with an open heart and mind, and you will gain a new perspective.